Harriman Hickenlooper, a veteran of the 6th Iowa Infantry, came back from what some would call “The War of the Rebellion” and what others later would call the “War Between the States” with an unkept promise, a score to settle and a debt to repay. His parents who had taken out a mortgage on the family farm had both died during the war; his brother Alonzo would also die in the war in Harriman’s arms. It has been two years since Harriman had returned home. The Appanoose County farmer was heavily in debt, behind on the mortgage payments and struggling to keep up the family farm all on his own. Walter Ridley, formerly the Colonel of the 6th Iowa Infantry and now after the war was on the board of directors of the “Farmer’s and Merchant’s Bank,” Centerville, Iowa’s only bank, which held the note on the Hickenlooper farm. In a move to avoid the embarrassment to bank foreclosing on one of Appanoose County’s war veterans, Ridley, bought the loan from the bank. At a meeting of Centerville’s veterans, Harriman proposes a bet between he and Colonel Ridley; that Harriman could walk from Atlanta to Savannah, following the path taken by the 6th Iowa during William T. Sherman’s March to the Sea, unarmed, while carrying a United States flag, and return to Centerville unharmed by January 1, 1868 (giving Harriman 44 to complete the fete) with tangible proof of his journey. If he makes it back by New Year’s Day he will get his farm free and clear, if he doesn’t Ridley will get the farm. Seventeen year old Rufus Dewes, a young man wanting desperately to become a newspaper reporter, instantly senses Harriman’s journey would make a great story, and convinces Harriman to let him tag along on the journey. Rufus periodically sends back dispatches to Jack Connolly, editor of Centerville’s newspaper, The Loyal Citizen, in which they are published. The articles are quickly picked up by other newspapers across the country, and Harriman’s journey becomes a nationwide sensation as people clamor for details and wonder whether or not he will make it back in time, or even make it back at all. Along the their journey Harriman and Rufus are joined by a former slave named Jed, emancipated in name only, until the timely arrival of the Northerners, and Lucinda McWhorter, a young Georgia woman left destitute by the misfortunes of war. Will the quartet make it alive to Savannah? And if they do will Harriman make it back to Centerville in time to save his farm? And who are “The Ones They Left Behind?” You will have to read the book to find out for yourself. Iowa and family connections added to my experience of reading this book. Being a native of south-central Iowa, I was greatly surprised to pick up Mr. Elmaleh’s book, and realize it was partially set in Centerville, a real town in Iowa, and county seat of Appanoose County. My great Grandmother, Mary Alice Byrd Luce, is buried in Jerome, a small town just a few miles west of Centerville, so I am familiar with the area. Centerville and the 6th Iowa Infantry are the only real things in this book; the bank, the newspaper, the townspeople, and the members of the 6th Iowa Infantry are all fictional creations of the author. My father’s uncle, Lowell Miller, a medic during the Korean War, was killed in action and died in his brother’s arms, which reflected the story of Harriman and Alonzo, and gave to me an extra sense of poignancy to the story. And further my great great grandfather’s name was Alonzo Luce, and three of his brothers served in the Union Army during the Civil War, all of them, however were in different units and did not serve together. I also have several other relatives who participated in the march to Savannah. Mr. Elmaleh states he based his novel on a newspaper article about a real Civil War Veteran who retraced Sherman’s route from Atlanta to Savannah, but he does not reveal any details of the actual historical event. 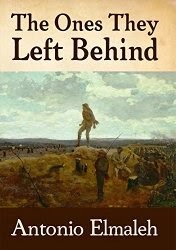 “The Ones They Left Behind” is well written and engaging. It is a quickly read page turner that I found myself unable to put down. ISBN 978-0990640622, 21 Cent Imprints Llc, © 2014, Hardcover, 260 pages, $19.95. To purchase click HERE. Thank you so much for your very kind review. I hope you don't mind a response from the author, but you mentioned the real life inspiration for the story. In the book's acknowledgements, I thank Gilbert Bates, who indeed made a bet he could carry a Union flag across the South during Reconstruction and not be harmed. Mark Twain, reporting on the march for the Territorial Enterprise, wrote that Bates would encounter people "likely to take his scalp." However, Bates met with nothing but hospitality - although his story is very different to the journey undertaken by Harriman in my novel. Thank you so much again for reading and reviewing THE ONES THEY LEFT BEHIND.